What does it take to be a professional trader? Even if you’ve done well in school and your professional career, making the switch to day trading or trying to earn supplementary income is no easy task. It’s tempting to look at a bunch of day trading courses and software to expedite the process. Are any trading courses really worth it? We’ve seen dozens of people who say they’ve spent thousands of dollars pursuing the trading dream. To competently play a musical instrument, studying the instrument will only get you so far. You need to spend time playing, “hearing” your mistakes, and repeating until you can improvise. No course will teach you that because you must put in some time to gain experience. What sets DayTradeToWin apart from most trading schools is that their programs are centered around the trading experience. They encourage downloading a trading platform and applying a real-time data feed. The idea is to replicate a live trading environment as much as possible. Using a simulated account, you can track your performance. There is no true way to replicate the live account experience, but NinjaTrader makes a solid effort. Right now, we’re seeing the E-mini S&P 500 market recover from a considerable period of bearish activity during December 2018. 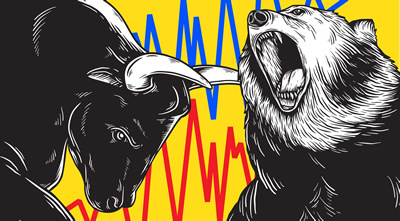 All the traders are asking, are we in a steady reversal period of bullish activity? So far, so good. The bullish activity has been fairly consistent thus far. Of course, futures traders can make (and lose) money in both up and down markets. What most traders dislike is choppy activity, where the market cannot make up its mind and appears more random than normal. Speaking of unpredictability, your trading research may have produced articles discussing how AI trading systems manipulate the market to trick average Joe traders into placing losing trades. Heading into 2019, we have no reason to believe that these extremely fast trading systems will be any less impactful. Perhaps now is the best time to distinguish yourself from the heard and take a look at how sticking to specific rules can keep you on the same path. Take a look at these trading courses. What does it take to be a professional trader? Are you considering becoming a professional trader as a career? Then read on to get clarification to common misconceptions. When the average person thinks “day trading” they think about trading stocks. Trading stocks requires around $25,000 USD. This is often called the PDT (Pattern Day Trader) rule. This amount is the minimum equity on any day that you trade. If you make an average or modest U.S. income, that cost is quite the hurdle! It is rather difficult to invest in markets that are inherently uncertain. In comparison, futures are also regulated by U.S. federal agencies. Many traders start futures trading accounts with a couple thousand dollars. Although consecutive losses can drain these accounts, infusing a couple more thousand can help create an account-busting buffer against consecutive or significant loss. Cryptocurrency trading (often called “crypto trading”) is appealing due to the small transaction fees, 24/7 market access, and few stipulations. However, many big investment advisors and cryptocurrency experts have said that crypto markets should not be traded. They claim the value of these systems is actually the underlying technology in which digital currency is exchanged, validated, and logged. You have probably seen news reports that discuss the unpredictability of Bitcoin. When it falls, it falls! Another appeal of crypto trading is the low cost barrier. If you are getting into trading because you have $500 to trade with, you will probably have to reduce your profit and loss potential. It may take a while before any sizable profits stack up. Then there are the career trading professionals. These are people with degrees in finance, mathematics, computer science, engineering, etc. People with such degrees may have a better chance of guaranteed success applying their professional skills in a traditional career path. Why risk devoting your career to a highly competitive firm that rewards the top of the top? If your skills are that good, maybe you would have also been successful figuring out how to trade on your own, so what does the hedge fund really get you? Create your own or become a bazillionaire with your amazing skills. Many traders start with at-home futures trading because the costs are reasonable and you can practice at your leisure. The NinjaTrader trading software allows for simulated day trading off-hours. In the event you have access to a computer during U.S. morning hours, you can use the platform with a real-time practice data feed to really hone your skills. Are you interested in learning more? Drop us a comment and we’ll set you up! Did you see the January Effect video from earlier this year? The January Effect is a forecasting strategy for predicting overall E-mini price movement for the entire year. In short, if price loses higher than it opens in January, price will be higher at the end of December. During the year, you can look to swing trade multiple times. These setups occur when price retraces from towards previous highs. The idea is to get in halfway. Use your trading platform’s Fibonacci tool to see a halfway point. We configure the tool in NinjaTrader to only show 0%, 50%, and 100% levels. If you switch to a daily chart, you can get a better idea of price activity so far. Since April 2018, we’ve seen price continue to climb higher with some excellent opportunities to swing trade. In the video (specifically 3:28), you can see an example of the Fibonacci tool being used to identify such trades. A swing trade can open you up to more risk because you’re holding positions for longer than intraday. Therefore, not all traders can swing trade. Your broker and account funding must be compatible. And of course, there is no guarantee the January Effect will be accurate or that a retracement will not suddenly turn against you. Do you think price will indeed close higher in December of this year? Have you gone back to see if 2017 and 2016 January Effect were correct? Do you think you can predict trending days in advance with high probability? We will post another video in a few months one way or another. At the time of writing, only four months remain in 2018. Want to learn more? Sign up for the next Mentorship class. A new class begins on August 14, 2018. Get the first week’s course and software right away (ATO 2 strategy) when you sign up. Did you see yesterday’s ATO 2 and Atlas Line signals? Here’s another example of how one trading system can work with another. The Atlas Line and ATO 2 once again agreed that “long” was the way to go. Both signals appeared around 10 a.m. EDT. The signals appear upon bar close. That means you have a little bit of time to place a trade. The included live training and training video cover what type of order to place. As you probably saw from yesterday’s video, marker orders can work just fine. Some traders may consider the E-mini’s Aug. 2 activity to be a trending day. Trending days, though considered easier to trade, are not very common. Choppy days or days where short periods of upward and downward movement occur are much more common. Overall, a good trading system should be able to catch more winning than losing trades. 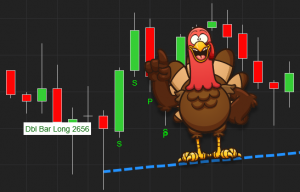 The video spends a bit of time reviewing how to add indicators to your chart. By default, NinjaTrader comes with many indicators. If you bought and installed the ATO 2 and Atlas Line, you will see it on the indicator list. Otherwise, you can practice with some of the free indicators. We use the ATR and Bar Timer most often. Once an indicator is imported, it’s a good idea to save the original .zip file. We encourage our clients to put all of our “DTTW” indicators in a folder for safekeeping. In case a new computer is purchased, it’s easy to transfer over the files for importing into a new NinjaTrader installation. 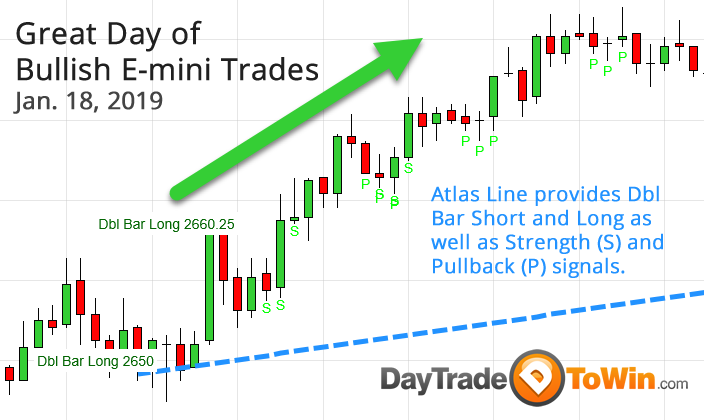 If you are unable to trade during the first 2.5 hours of the trading day (9:30 a.m. to noon, EDT), then you may want to use the Market Replay (also called Playback Connection) feature. You can download and play back historical price data and practice trade as though your charts are live. If you want to learn more about each trading system, visit the official ATO 2 and Atlas Line pages.